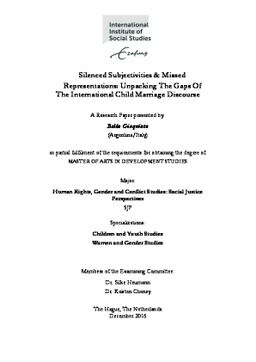 Erasmus University Thesis Repository: Silenced subjectivities & missed representations: Unpacking the gaps of the international child marriage discourse. Silenced subjectivities & missed representations: Unpacking the gaps of the international child marriage discourse. At a time when “the girl child” is the new favourite investment, beneficiary and symbol of hope for the development machine, child marriage has become one of the central issues in the girl agenda. However, the much-celebrated global campaign against child marriage has come in the form of a monolithic representation of what this practice constitutes, underpinned by contested notions of gender, race and age, and colonial notions about girls’ agency, sexuality and vulnerability. Such understandings in turn condition how child marriage is framed as a site for development intervention, while obfuscating alternative realities of this practice that do not fit the dominant discourse. Nonetheless, it is time to question what is the problem represented to be with child marriage that has permeated all levels of development policy, scholarship and practice. In this research, I thus aim to explore how dominant representations of child marriage structure how the international development community understands, problematizes and tries to address this practice. I will do so, through an exploration of discourse using techniques in critical discourse analysis, namely Carol Bacchi’s WPR approach to policy analysis, contextualized within the Girls Not Brides Global Partnership to End Child Marriage. In particular, I draw from secondary data and empirical research that speaks to the nuances of child marriage to construct my argument. This research is informed by the works of post-colonial feminist writers and scholars from the new sociology of childhood, as well as post-development theory. I hope that unpacking the limits to the dominant child marriage discourse invites development practitioners and academics to engage more wholly with the contextual specificity of this practice, and generates greater awareness about the material consequences of dominant representations.